Location: Hemingway traveled all over the world, so he called a lot of places “home” at one point or another, including Oak Park, Illinois; Paris, France; Key West, Florida; Havana, Cuba; and Ketchum, Idaho. ​Ernest Hemingway was born in Oak Park, Illinois on 21 July 1899. Unlike many authors of his generation, Hemingway did not attend college, but instead went to work as a journalist after high school. He left this position in early 1918 to join the American Red Cross Ambulance Service and play a part in the First World War. He was injured by an Austrian trench mortar on 8 July 1918 in Italy and spent the next several months recuperating. Following his recovery and a brief return to the U.S., Hemingway moved to Paris where he began his writing career in earnest. He first gained prominence with his novel, The Sun Also Rises (1926), and solidified it three years later with the publication of his World War I novel, A Farewell to Arms. which details his early years in Paris. Hemingway committed suicide at his Ketchum, Idaho home on 2 July 1961. Hemingway had four wives in his lifetime: Hadley Richardson, Pauline Pfeiffer, Martha Gellhorn (a journalist and author in her own right), and Mary Welsh. He had one son, John “Bumby” Hemingway by his first wife, and two others, Patrick and Gregory, by his second marriage. Katie Warczak is a graduate student at the Pennsylvania State University specializing in American literature. She is a Graduate Research Assistant for the Hemingway Letters Project and was previously a Junior Research Fellow at the Newberry Library in Chicago. ​Hemingway wrote as a way to get to the heart of life experiences and express them in an accurate manner. This belief, combined with his experience as a journalist, helped shape the short, to-the-point, yet profound, writing style for which he is known. What other creative activities was he involved in? Hemingway dabbled with poetry in addition to prose, but rarely published his poems after the 1920s. Additionally, the author had a lifelong appreciation for fine art and while he did not paint himself, Hemingway was a great admirer of artists such as Pablo Picasso, Joan Miró, and Paul Cézanne. Who was his favorite author and why? 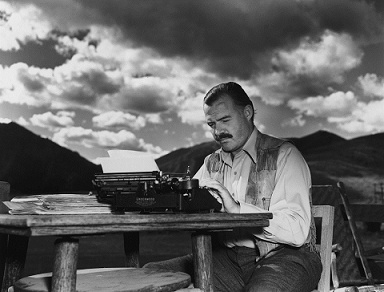 ​Hemingway admired a number of writers, but he was too competitive to have a favorite. However, he was very well read. He regularly recommended Mark Twain’s The Adventures of Huckleberry Finn, Rudyard Kipling, Stephen Crane, Fyodor Dostoyevsky, James Joyce, Henry James’s short stories, Guy de Maupassant, Gustave Flaubert, Stendhal, and Thomas Mann. He also had an extensive library and appreciated Shakespeare, John Donne, Ezra Pound’s Cantos, David Garnett, Archibald MacLeish, Gertrude Stein’s early works, Marjorie Kinnan Rawlings, Dawn Powell, and Dorothy Parker. Tell us about the mechanics of how he wrote. Finally, what did he think about Carp, the fish, if anything at all? 1 Brasch, James, and Joseph Sigman. Hemingway’s Library, pp. 17-18. 2 Baker, Carlos. Ernest Hemingway: A Life Story. Scribner’s, 1969, p. 244. 3 Chakrabarty, Prosanta. “Papa’s Fish: A Note on Neomerinthe Hemingwayi.” The Hemingway Review, vol. 25, no. 1, 2005, p. 109. 4 “Ernest Hemingway.” International Game Fish Association.